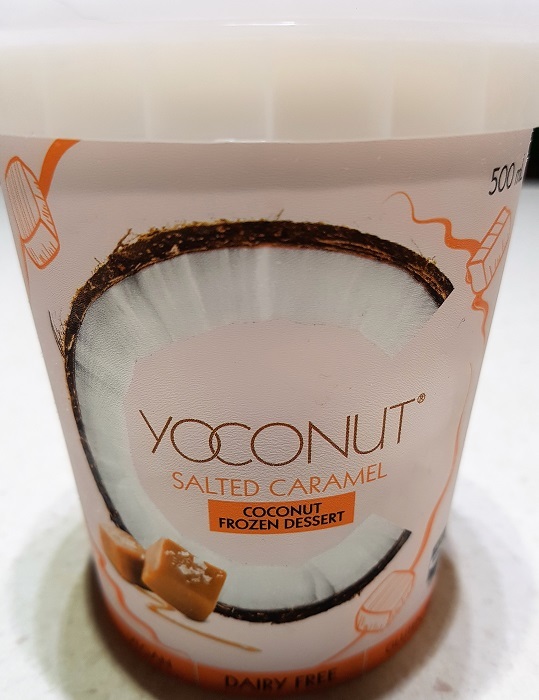 Coconut icecream suddenly appeared on the shelf at Aldi. Seems nice, said I, at the end of our shopping trip. I assumed healthiness, like Kramer assumed that his tupperware would be returned.. That was one heck of a mistake on my part. I normally check the labels before I buy anything, but it was late, the store was about to close, and really how bad could it be? It could be REALLY REALLY bad. 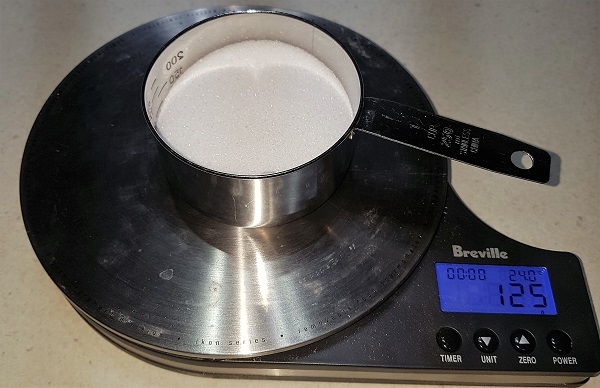 In a 500g container of icecream, these folks packed in just over 125g of sugar. 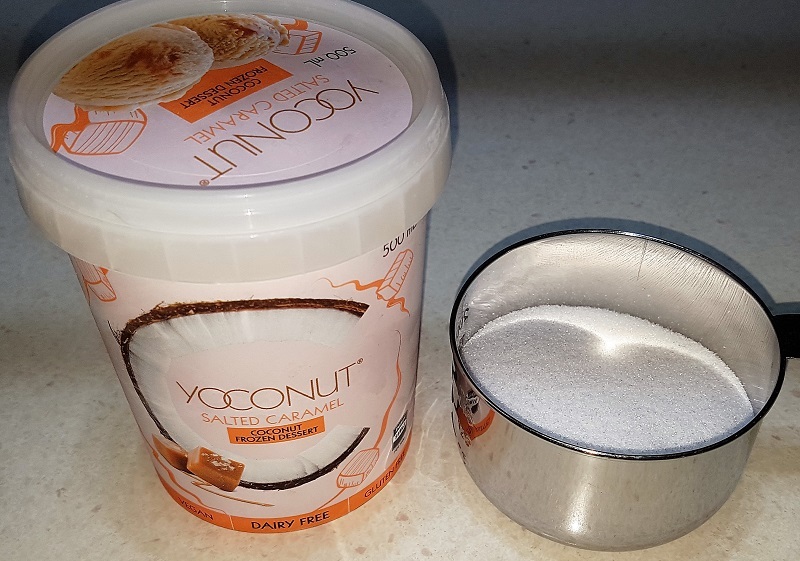 AKA 30 teaspoons. AKA Half a cup. 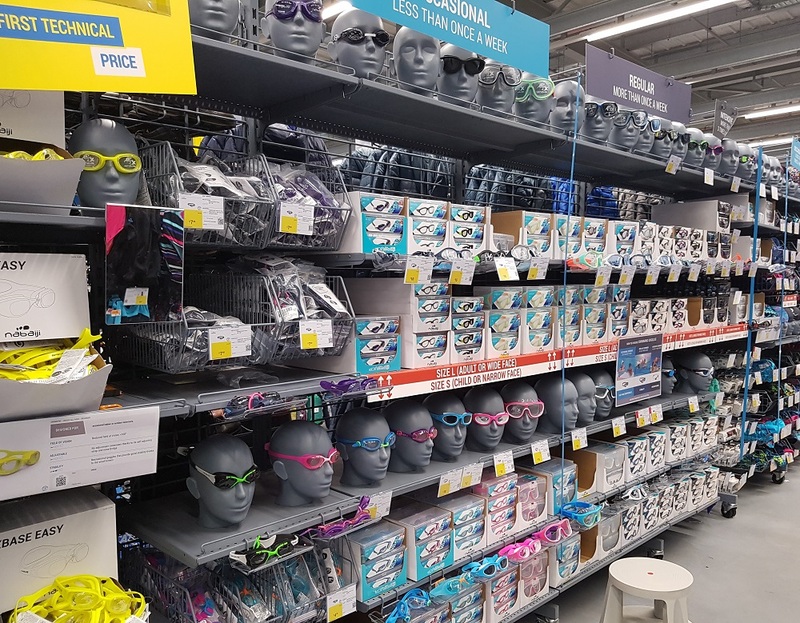 The goggles start from $3.50 and they have an enormous range of them. If you can’t find a pair here I would be very surprised. They also have corrective lenses for same goggles at very reasonable prices. 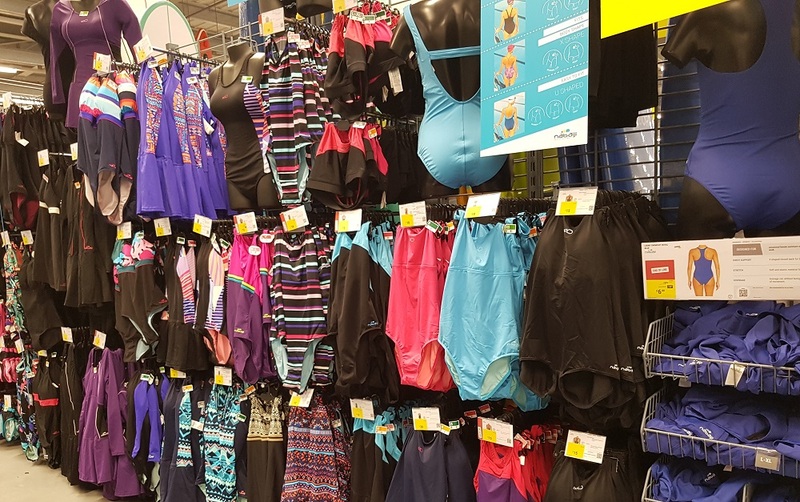 There is a huge choice of swimming outfits. When it is time to pay, you place your items in this box and it reads the RFID chip. Also Decathlon is a membership warehouse though membership is free. You can sign up on arrival and scan the membership card on your phone into the Stocard app, so that you can use it when you check out. 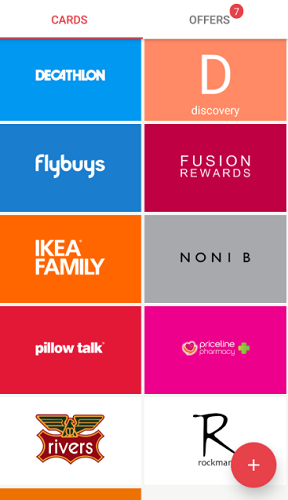 That was the first time I ever saw the Stocard app but you can be sure I am now making great use of it – I have scanned in 15 membership/loyalty/rewards cards which I used to carry with me everywhere – which is MADNESS if you think about it. Madness! And I am going to check my special hiding place because I took out a lot of cards I don’t use a while ago. The app has an option to turn on the “card assistant” so when you approach a store your phone will pop up a notification to easily access the card for that nearby store. This does not seem to work for Coles, though, at least for me. 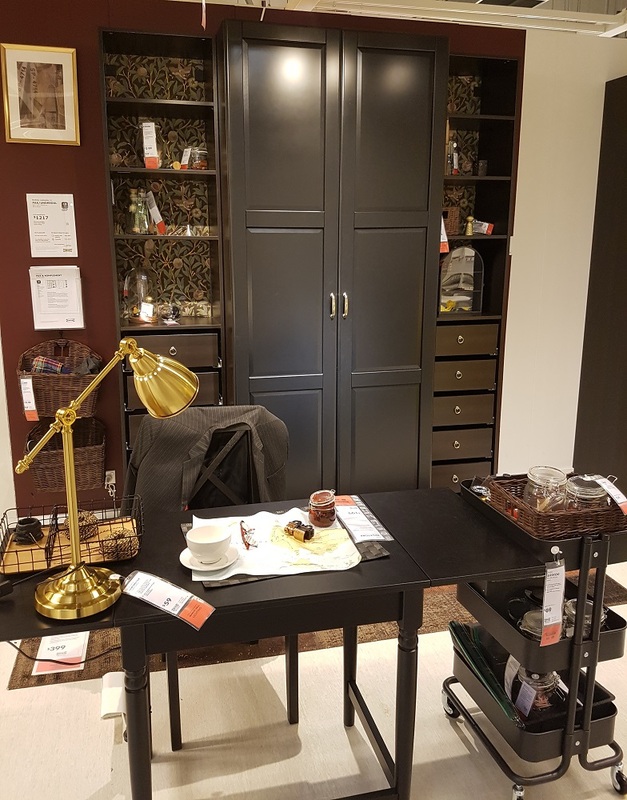 After we bought the rollerblades, we wandered back over to IKEA for afternoon coffee and a wander, and to get my curtains. They had this little setup which looked like perhaps Harry Potter or Indiana Jones might have just walked away from. Our favourite KALAS is now available in a new colour. I’m not such a fan of it – I prefer the rainbow set – and apparently The Other Half is banning me from buying any more of these anyway. 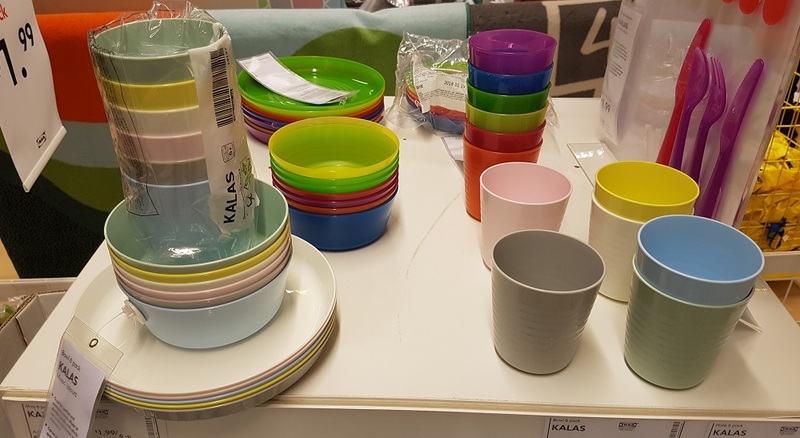 I feel like you can never have enough KALAS bowls and plates. Microwave and dishwasher safe, unbreakable, so useful. We did not buy this even though both of us really wanted to. 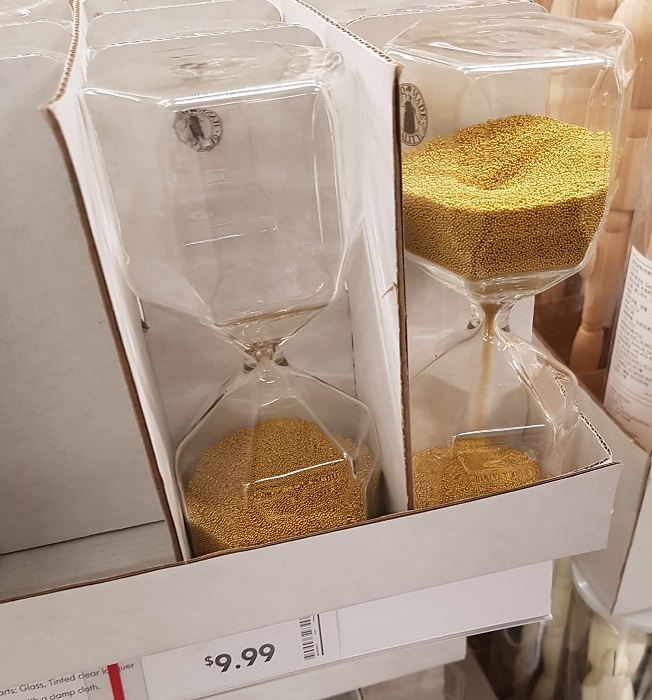 We flipped it over and stood there and watched the gorgeous gold “sand” melt through the hourglass, and then we did it again, and yet another time, while we debated whether we could/would/should buy it. What would we use it for? 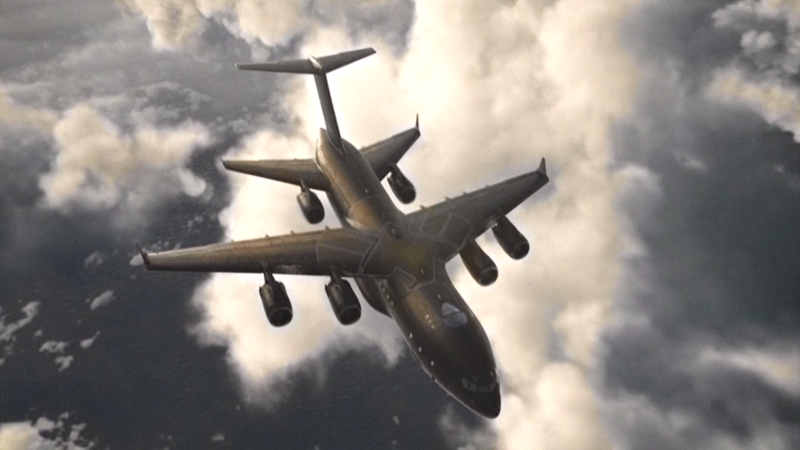 Did we need it, or did we just really want it? In the end we chose not to buy it, but will it be like Indiana Jones choosing the holy grail? Did we choose poorly, or wisely? We left IKEA around 3pm and headed back down the coast. 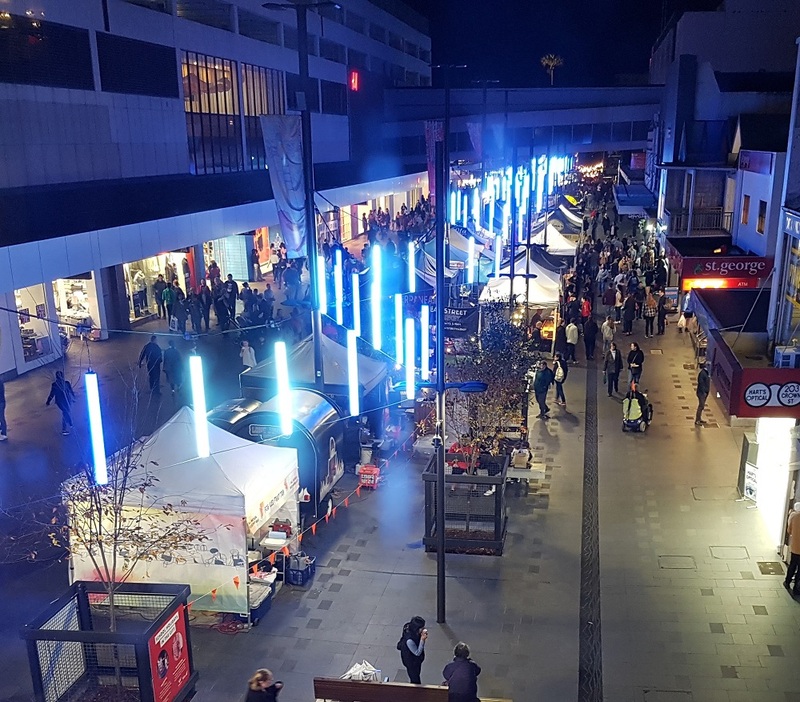 We had a destination in mind – Eat Street is on every Thursday night in Wollongong and the weather was perfect for it – cold but not windy. We have been once before and apparently I did not blog about it here, which surprises me but then again there is a lot of stuff I don’t post about. 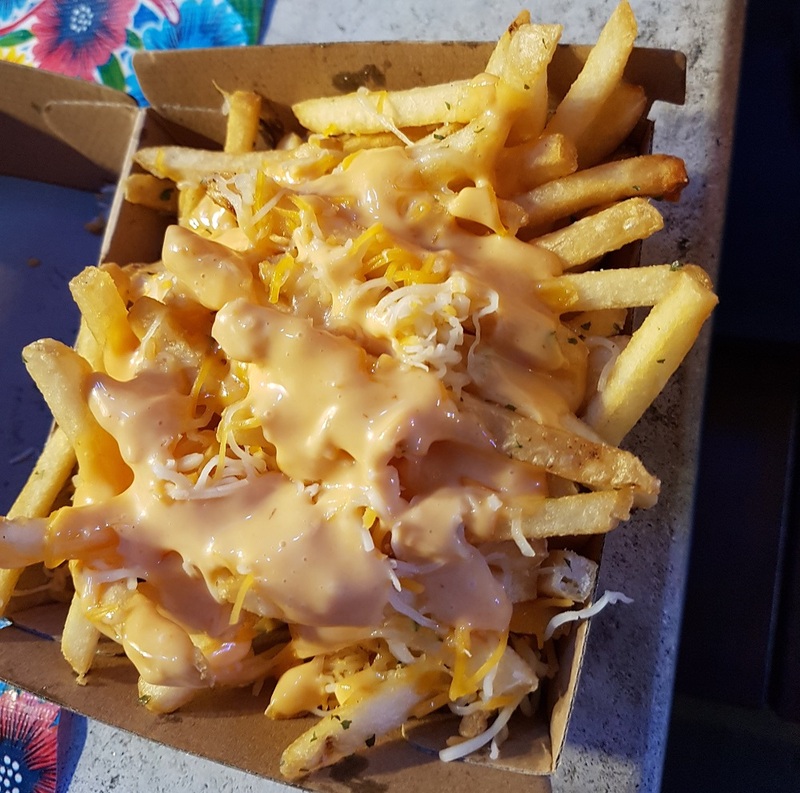 I got Poutine from La Poutine food truck. Mine had bacon and ground beef on top with the cheese curds and gravy. It was awesome. 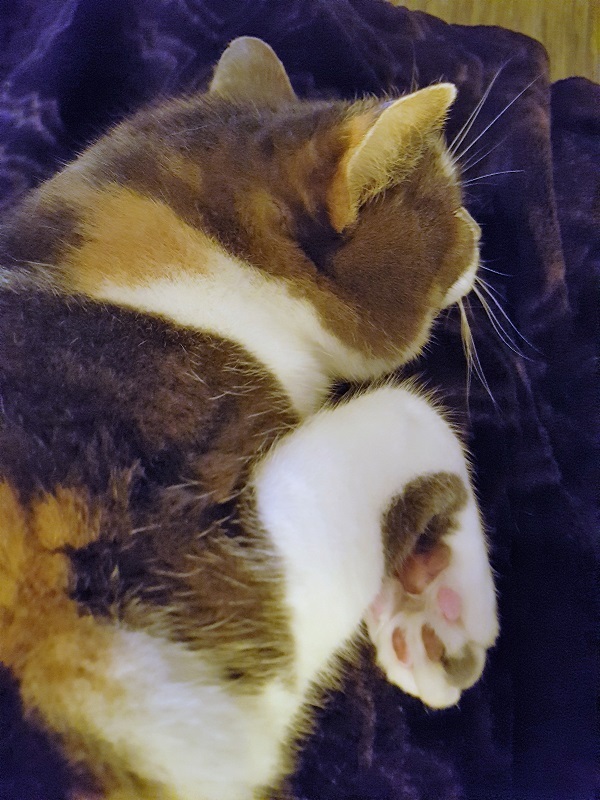 Perfect for a cold night. 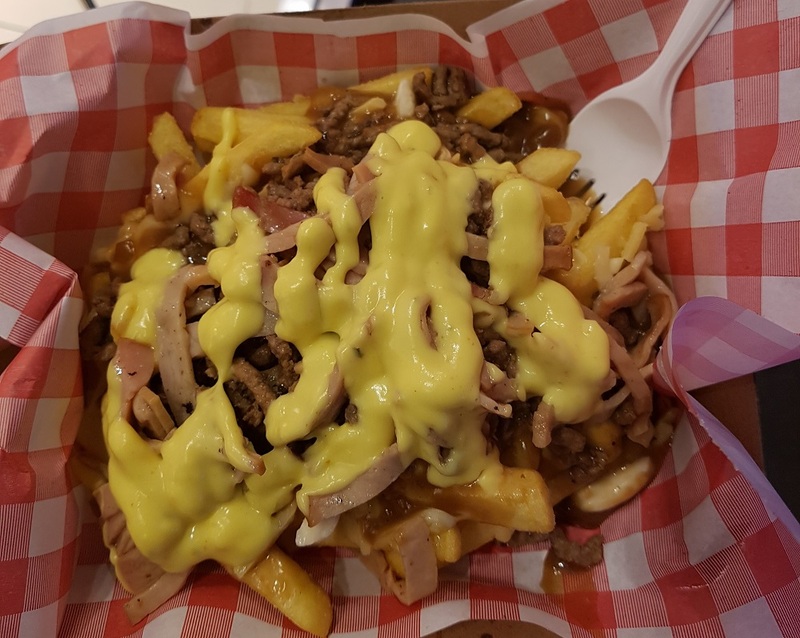 The other half got some loaded fries – they had cheese and a spicy chipotle aioli – from Norma’s Burger Bar plus a burger. He chose the same stall last time and when he enjoys something he tends to stick with it. Soon after we finished our food, we were on our way home, after a very long day out. 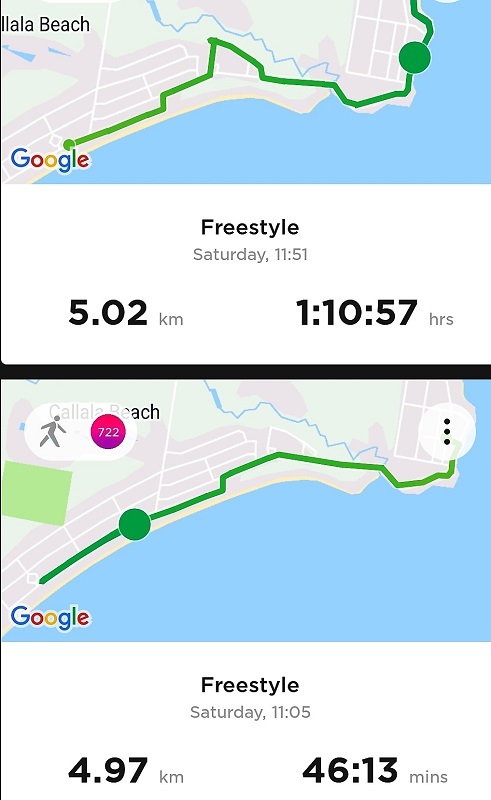 We planned to head out for a run & rollerblade (I run, he rollerblades) the next day, and a bushwalk sometime over the weekend, too. But that is a story for another day. I ask this question a lot to the great annoyance of people around me. Sometimes *I* will like to know more, and finding this new building in the carpark of IKEA Tempe was one such occasion. 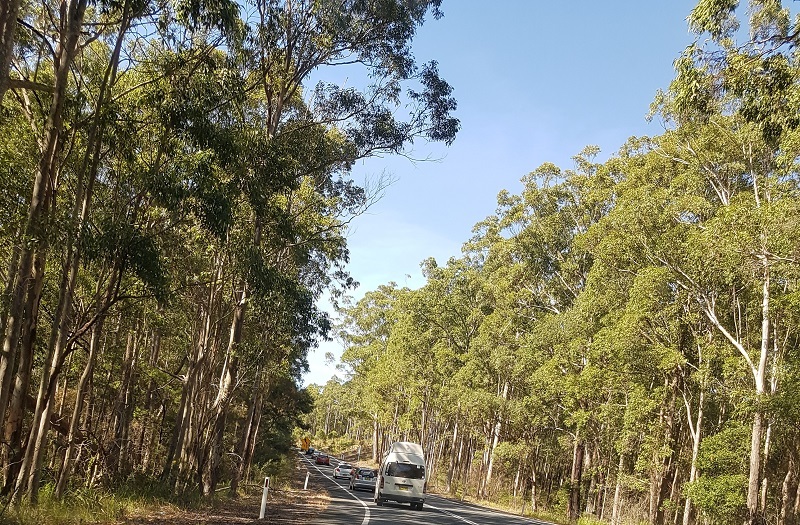 It was recently my birthday – no, I don’t tell people and I don’t celebrate them for the most part – but I was asked by The Other Half where would I like to go for dinner, and I chose the Korean BBQ that we have visited a few times in Campsie, a couple of hours drive away. 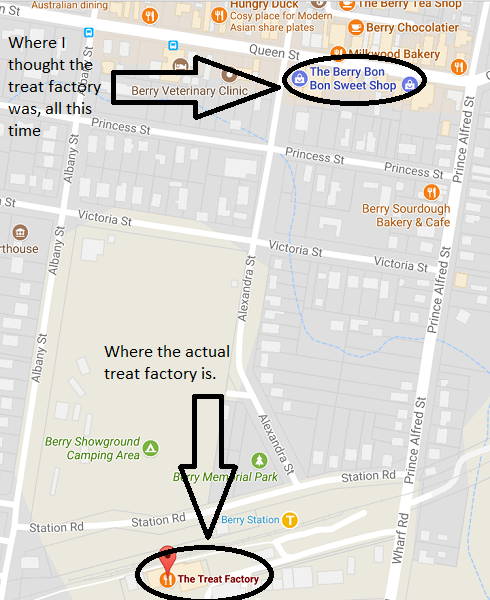 My parents were most unthrilled by this concept – a 4 hour return trip just to eat dinner? But they did not understand, this is two hours of all you can eat Korean BBQ with a sushi buffet, a hot food bar, and desserts. It is like the old days of all you can eat Pizza Hut, only more healthy. But when I told them our nephew would be meeting us, they got on board. Well, mostly, there was still some grumbling and “I can’t believe we’re going all that way“. I mean these are people that complain about going 7km to eat dinner, so I was expecting this. I was also expecting the end result – which is they go, they eat, they LOVE it, and they demand to go back. I did not take any photos as we were too busy eating, drinking, cooking on those little charcoal BBQs in the middle of the table, and me personally I was peeling a lot of prawns, who wants to pick up their phone in the middle of that with prawny fingers? Oh, the prawns, you guys. They are so delicious cooked on that bbq. I set a target of eating 19. I failed. Mainly thanks to the sushi, which was also great. 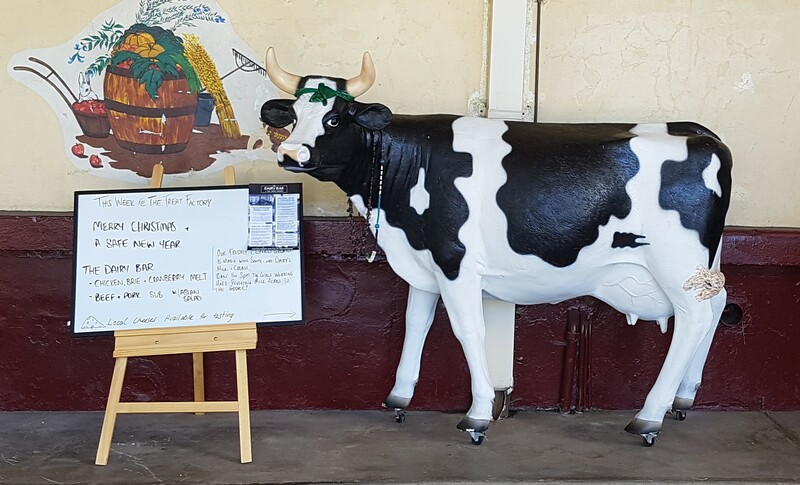 Here is a lovely blog post with photos – Se Jong Korean Bbq Buffet, Campsie. Since that post they have installed extractor fans inside which make things a lot less smoky. On the way home we stopped in at IKEA so Mother could get some small side tables for her guest rooms, and just so we could wander the halls happily. This is when we discovered the Decathlon building. 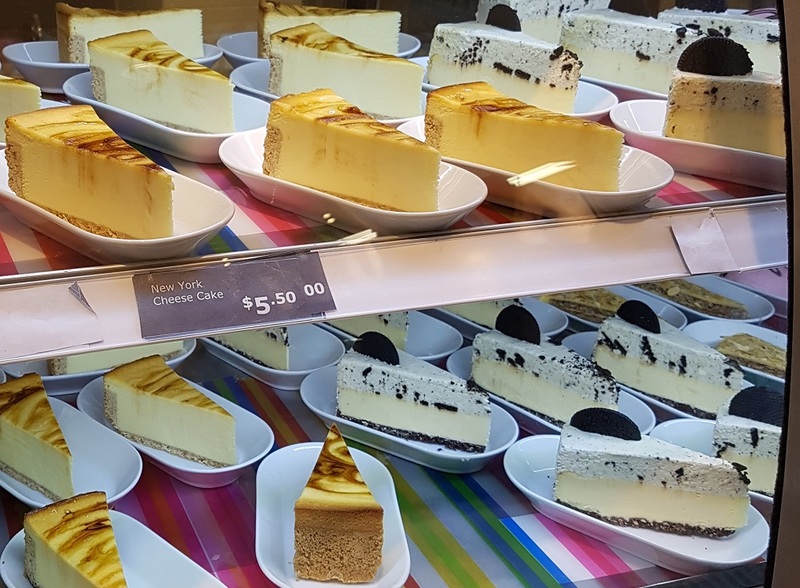 We resisted the HUGE slices of cheesecake because we’d just eaten for 2 solid hours but we did get coffee before the long drive home. How do I find out more? Usually via my phone. 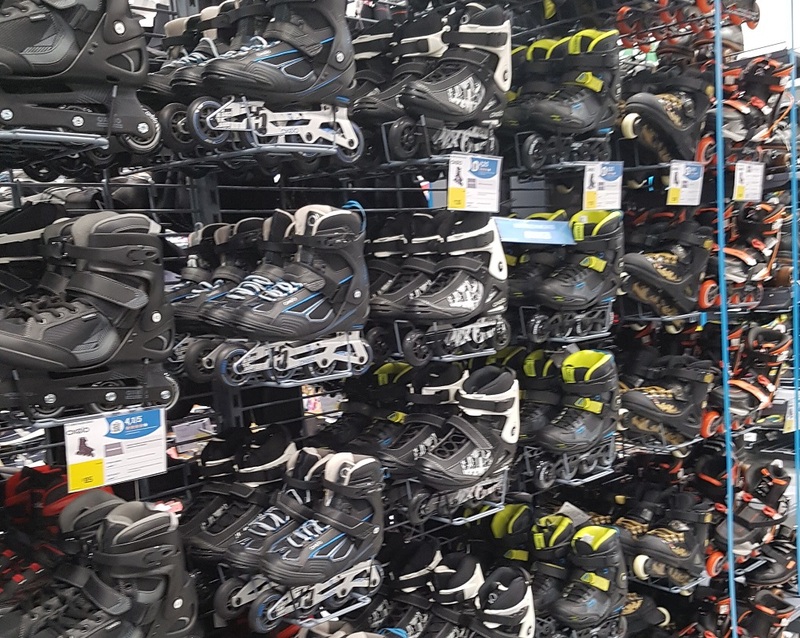 I went to the Decathlon website and the very first thing to appear was a set of rollerblades – a secret message to us that we needed to return soonest – as The Other Half has been looking for rollerblades for some time now after his wheels biodegraded as a surprise to us. We decided we would return the next weekend, BUT.. 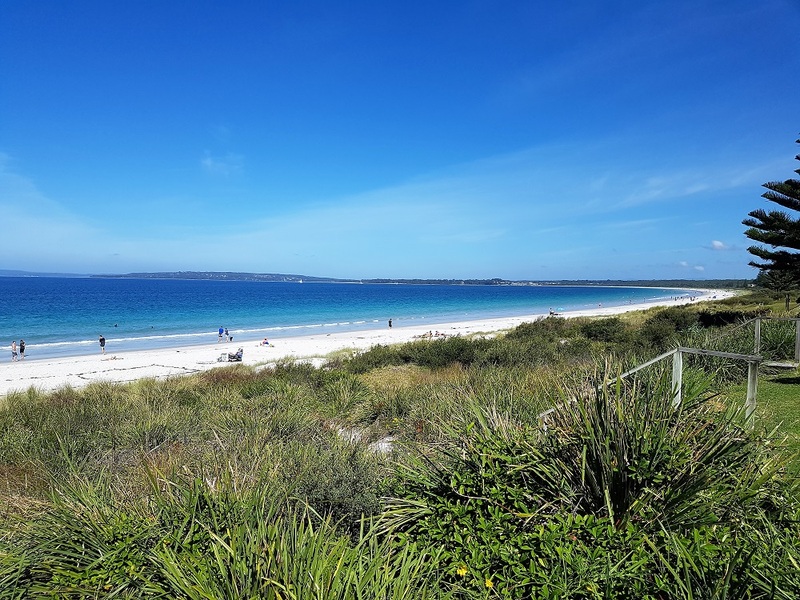 The following week, it turned out that The Other Half had little work to do at work, and instead of wander about trying to make work or create work, he arranged to take 2 days of his 5 weeks of holidays which he has been collecting up for some time now. And thus we found ourselves in the Polo on a Thursday, heading up to Sydney. We ate the Swedish Meatballs overlooking the store, and when we finished lunch we strolled across the carpark to check out Decathlon. It turns out this place is bizarre. A sports warehouse, you would expect all the usual brands, Nike, Adidas, maybe Reebok, etc. But there was not a single known brand to be found. The brands here are all brands I had never seen before. They are all specially made for this company. 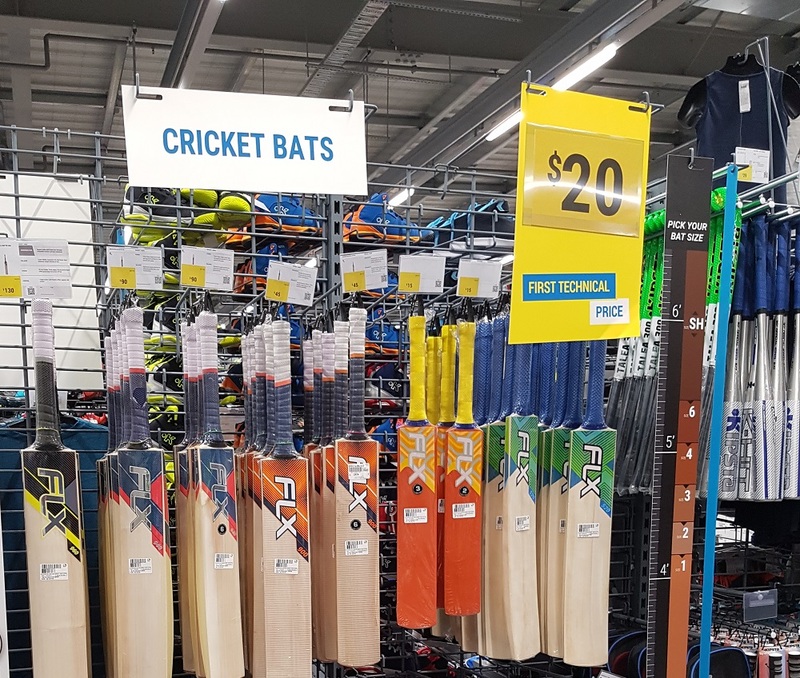 Even so the range of items is incredible, and the sports they have specific equipment for are many not well represented sports in “regular” sports stores in Australia. 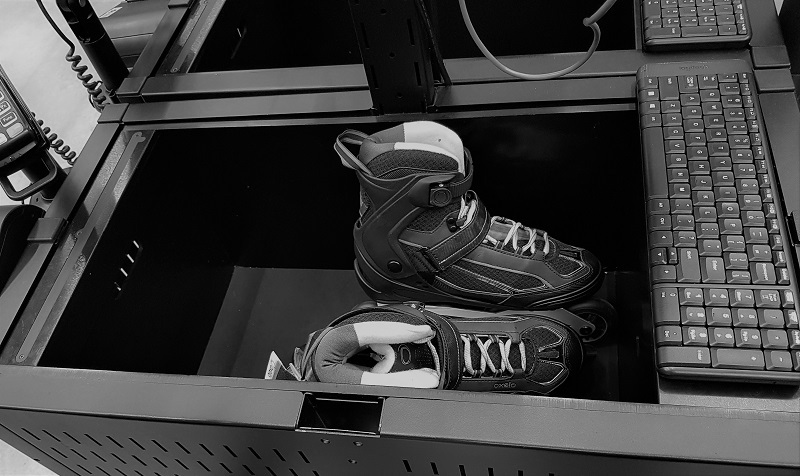 When have you seen a horse riding aisle at your local Rebel Sports? I was so stunned to see it I did not even take a photo! 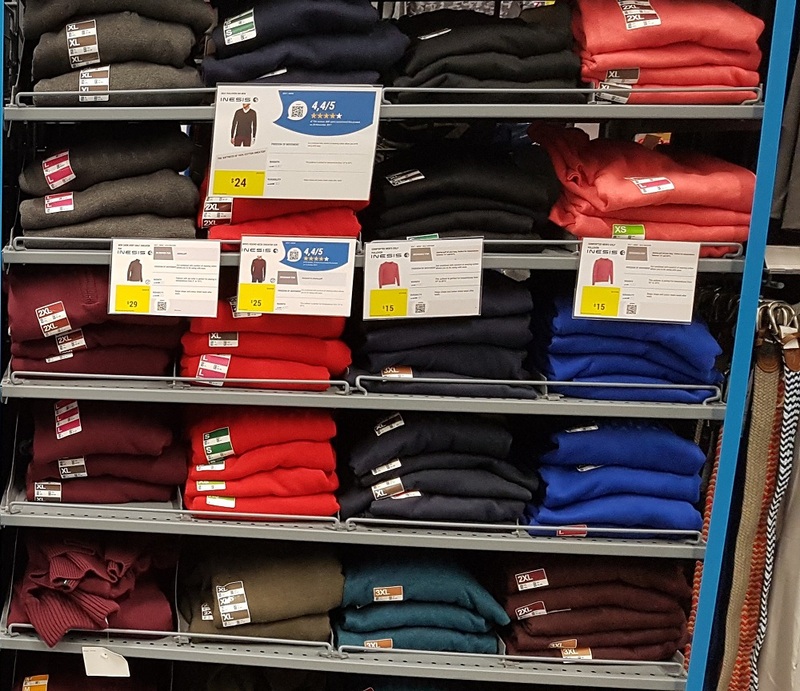 But I might have to go back for some jodhpurs and riding boots – both starting at $28. Would you like to know more? 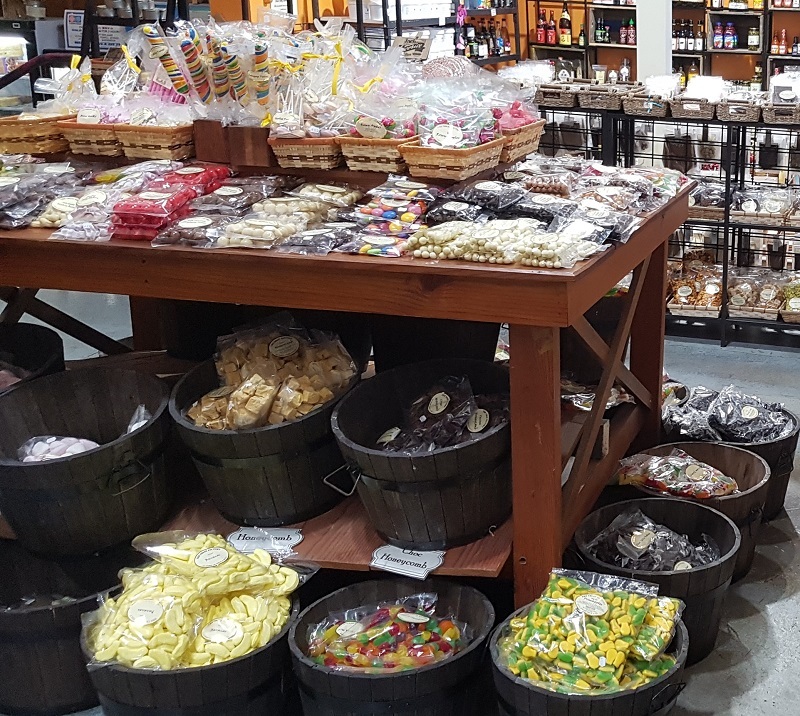 Here is the Wikipedia page, here is their Tempe website where you can take a 360 degree tour of the store, here is their regular website where you can search for items, and here are some of my photos from inside the store. These are jumpers suitable for golf, and walking. I liked the teal one. Look at all these socks especially sent to tempt me, but I did not buy any. Good Snoskred! 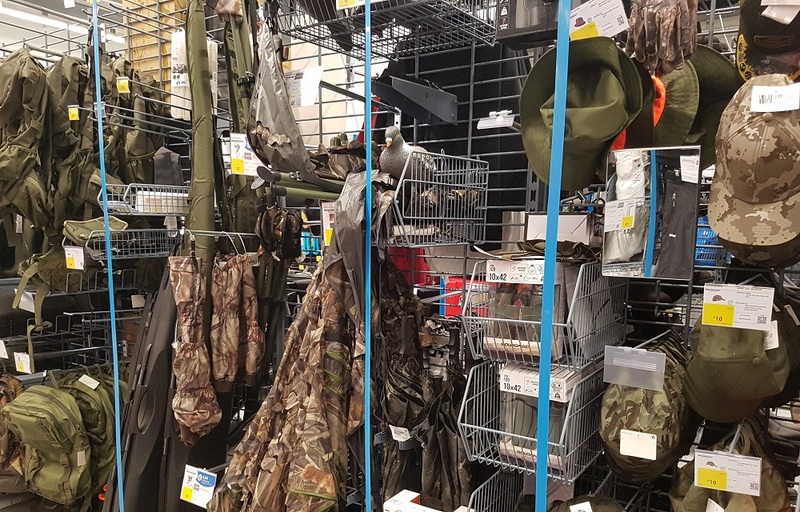 This is part of the camouflage section, for hunting, fishing, and various other hiding yourself in plain sight sports. I just really liked this photo but I also thought the camo shorts $29 and trousers $36 were very good value. The Other Half will like to try some, at some point. 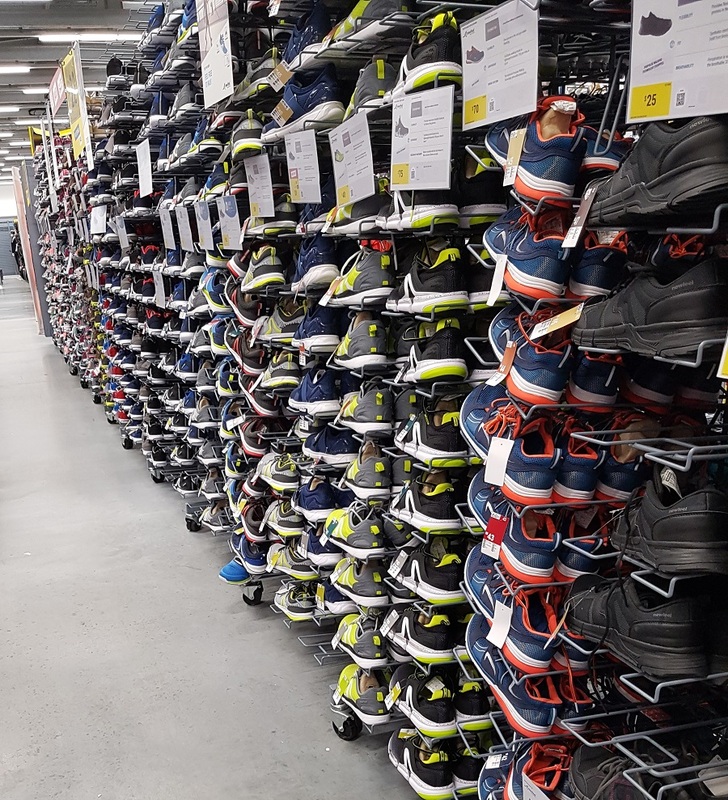 Most of these skate shoes were between $30-49. This would be excellent value when you have teenagers, I suspect. In fact I saw a lot of great value kids stuff, it felt like they cater very well for kids here. Ah, finally the section we are looking for. 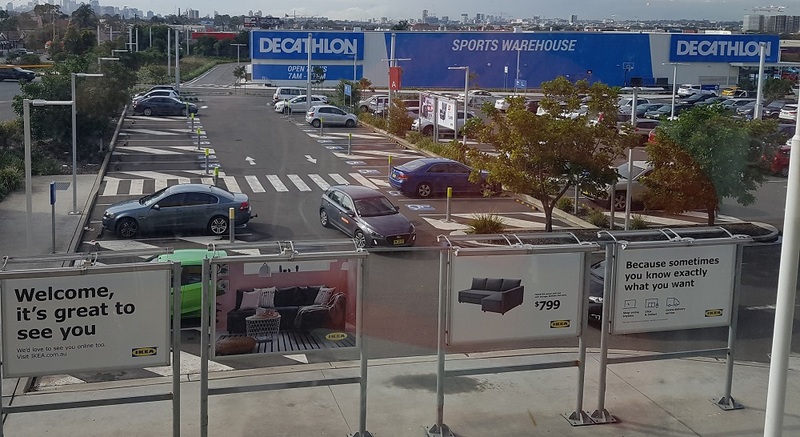 Never fear those in Melbourne, Decathlon will be opening in Box Hill in November. As usual Adelaide, Brisbane, Perth, Darwin, Tasmania, you are SOL. 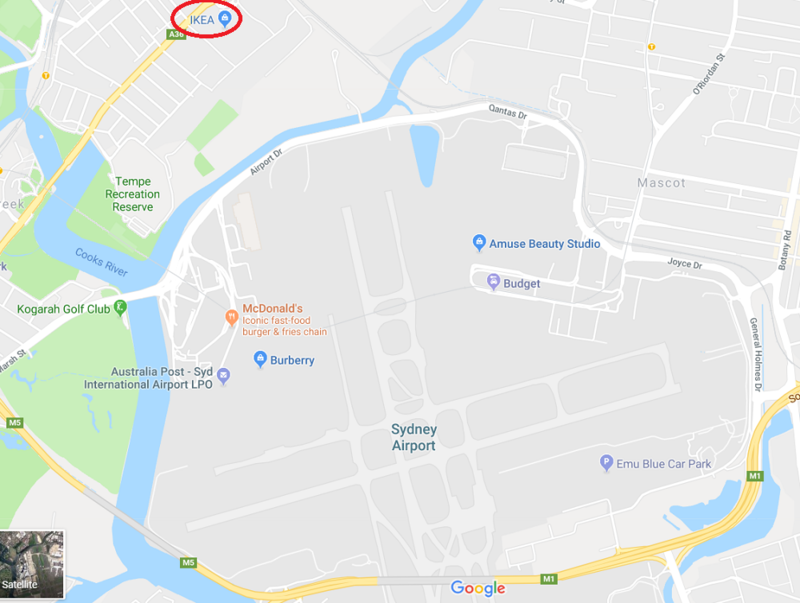 Jump on a plane, Tempe is right next to the airport though it is a bit of a hike from either terminal, mainly because there is a large container terminal in the way and no access road. I would recommend a taxi, if you are in urgent need of reasonably priced sports equipment. I do not “preach” about many things in life. Sure, I can suggest solutions on a myriad of subjects based on my personal experiences, and I do that here on my blog.. Travel. Eating out. How to avoid scammers. The importance of booking directly with a company rather than a via third party website. How to go from not running at all to running 5kms at a time without stopping – these are either already written posts or they are posts for another day. I have struggled with my weight all my life. Guess what? It is no longer a struggle for me, and a big reason for it is my lunch time protein shake. When I talk about protein shakes, I sometimes feel like I am trying to spread the good news and often folks just aren’t buying it. I want to be very clear about this. Yes, it probably did. I’m guessing you had a pre-flavoured protein shake. Those shakes contain artificial sweeteners and they all taste bad as a result. I do not know why flavoring must = sweetener, but apparently everyone involved in protein thinks it must be super sweet to make people drink it. 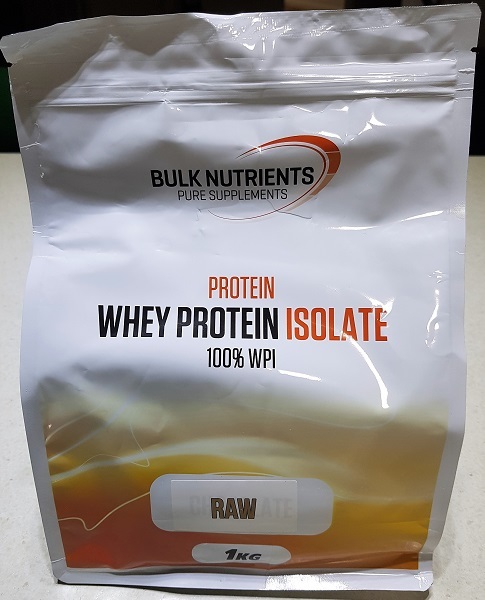 MY FIX – I buy raw protein without flavouring. I add my own flavour. I could serve my shake in a milkshake glass with whipped cream on top and you would have no idea that you were drinking a protein shake. You would think you are getting a frappe from Starbucks or Gloria Jean’s. 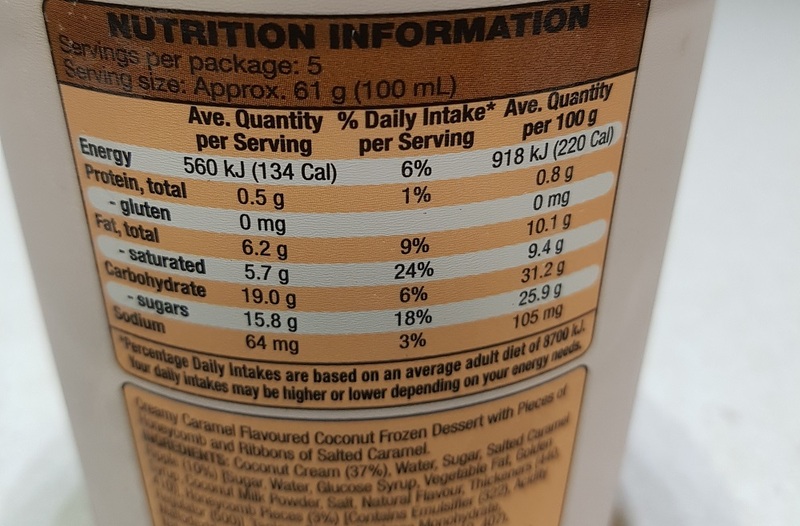 But unlike the frappe from Starbucks or Gloria Jeans which on average contains 30g of sugar, my shake has just 2 grams of sugar, which comes from the frozen banana. 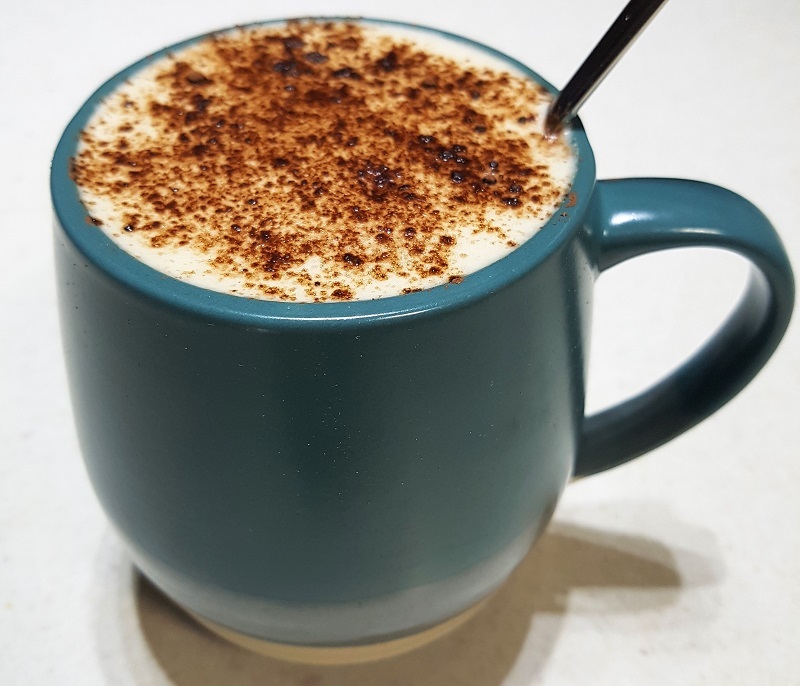 I do not add any sweetener to my shake because I feel the banana gives me all the sweetness I need, but if I did need to add some I would go with a touch of maple syrup. Their shake might have between 6-10g of protein – mine will have 37g of protein. Their shake will have around whopping 30-40g of carbs, mine has just 13g. Their shake will be 300+ calories. Mine is 220. Actually you can. I do it all the time. I tell you, if I drink the shake and wait 20 minutes, I will no longer be hungry and I will remain not hungry for at least 2-4 hours after I drink the shake, maybe even longer. And you don’t have to just have a shake if you don’t want to. You can add healthy snacks on the side. My go-to snacks are usually olives, hommus with carrot sticks, or nuts of some kind. However all the nutrition you need is more than likely right there in that shake, and adding snacks adds extra calories. Preparation is key. If you are like me and you don’t mind taking a bag or box in with you, then you can take your Nutri-Ninja with you to work. I measure out my protein ahead of time and have that in small containers and I take a small freezer pack with my 1/2 frozen banana and frozen coffee ice cube. I drink my shake right out of the cup, rinse it in the sink when I am done, take everything home with me when I go, then wash the cup and blender attachment at home that night. You could buy two Nutri-Ninjas and keep one at home and one at work, or you could invest in some kind of cheap second blender to keep at work. Shakes certainly do not have to be boring. I can drink a different flavoured shake every day of the week if I want to and I can get a little creative about it. Because my shake is so low in calories I do not mind adding something decadent to it once in a while. 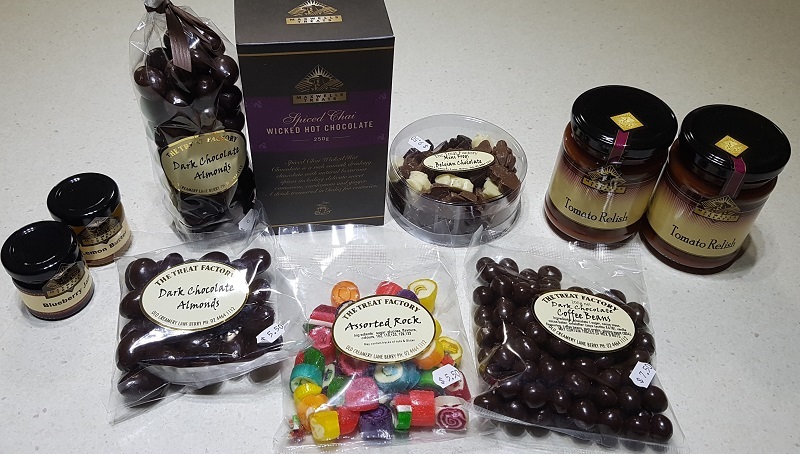 I might throw in some dark chocolate to give an extra dimension. I like to add peanut butter powder for a bit of extra savory flavour and if I don’t have any PB2 on hand I might add in a scoop of peanut butter. I sometimes treat myself on weekends by adding a few teaspoons of whipped cream. Salted caramel sauce is a good way to add extra taste. The bottom line is, I love how my shake tastes and I don’t see any need to change it. I am a big coffee lover, I love chocolate, I love cinnamon, put these things into my shake and I am happy. 35g-40g frozen banana – I break them into pieces and freeze. 1 frozen espresso coffee icecube. 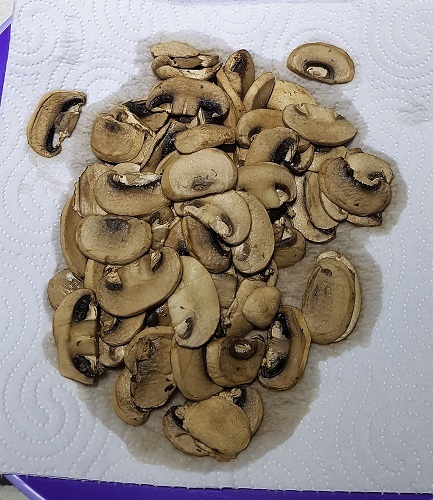 As part of the No Spend Days I have added into my Year Of Buying Nothing challenge for this year, I wanted to give freezing mushrooms a try. I have never frozen mushrooms before, but I have become a lot more creative in the freezing things department since our deep freeze arrived. 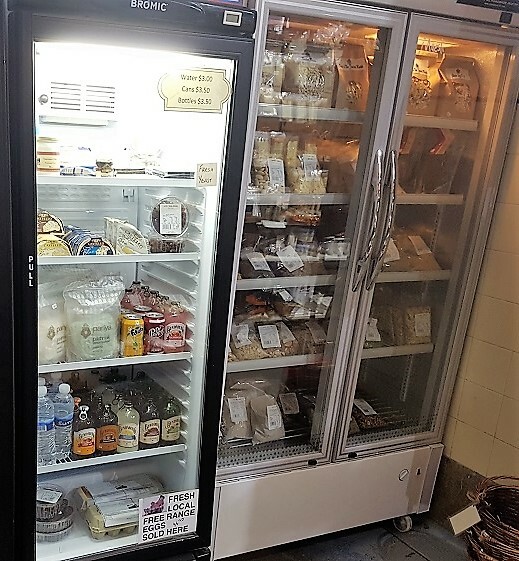 I freeze a lot of fruit which gets used in protein shakes plus espresso coffee shots, most of our meat is purchased in bulk and frozen, sometimes for up to 6 months if the deal is a good one. I even freeze watermelon rinds for the chooks to enjoy on a hot day. Sometimes these challenges can actually create super awesomeness. If I could manage to freeze the mushrooms, I could do a big bulk cook up every so often, whack them in the freezer, and every Thursday take out a packet for use on Friday. If I can do it in one hit, on a day that is not Friday, while listening to music or a podcast, and then have mushrooms for 2 months.. Wow that would be so great! Even greater would be if I can stock up when they are on special. 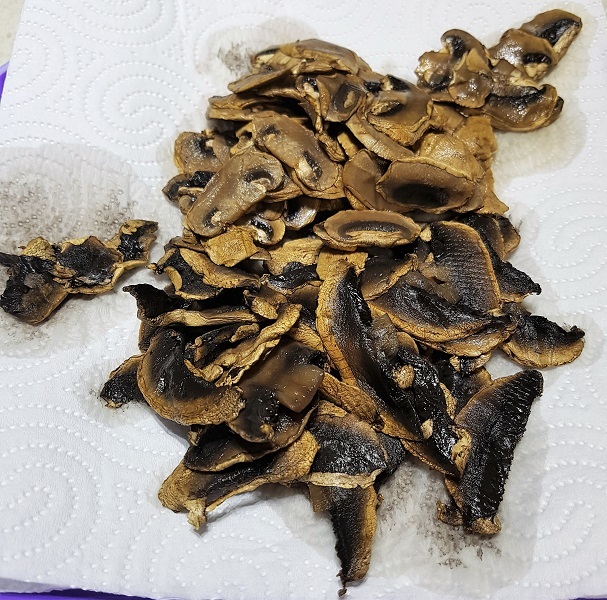 I have been pre-cooking my mushrooms for our weekly pizza for some years now, after one of my home made pizzas became very soggy and waterlogged due to mushroom moisture. 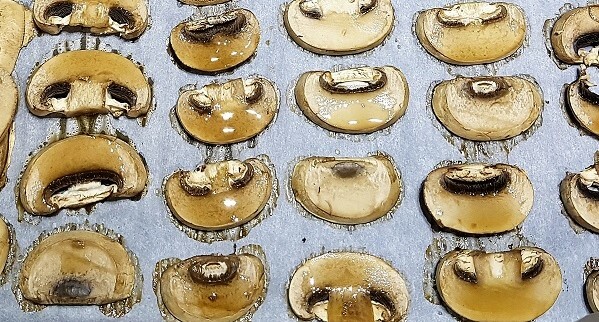 There is a LOT of moisture in mushrooms. How much moisture? I had two punnets of 375g bbq flat mushrooms from Aldi. I prepared them and cooked them in the oven. 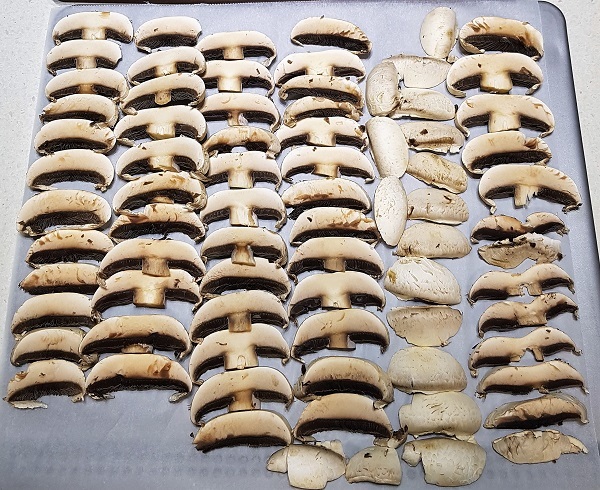 I then weighed them to find I now had 375g total of mushrooms – I had lost an entire 375g in the cooking process! Mushroom preparation has been the annoying part of my Fridays for a long time now, and sometimes an annoying part of Thursday or Wednesday or whatever day I remembered that I needed to get fresh mushrooms for Friday and would head off to the supermarket *just* to get mushrooms. 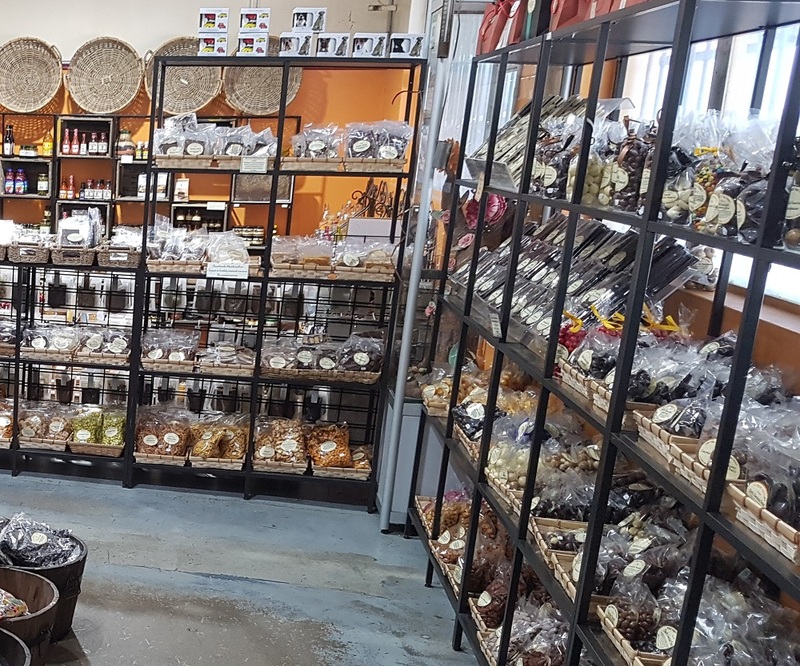 And while I was there, I would tend to buy other things – maybe things we did need like milk or vegetables, and sometimes things we did not need. The part I least like is having to rinse them before chopping, but they do grow in soil and manure, so that is always going to be something I do, to satisfy my germophobic brain. then blot with paper towel to remove excess moisture, and lay out on paper towel to drain. Normally this is where the mushroom meets the pizza base. But not today. Today we have some new steps. Foodsave the mushrooms, then place them in the freezer. 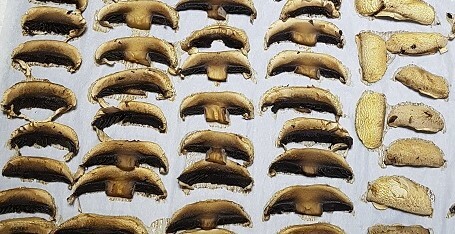 There is still quite a bit of moisture in these mushrooms even after cooking and draining, and that is the brown liquid you see in the next photo – which was taken after the mushrooms have been frozen. 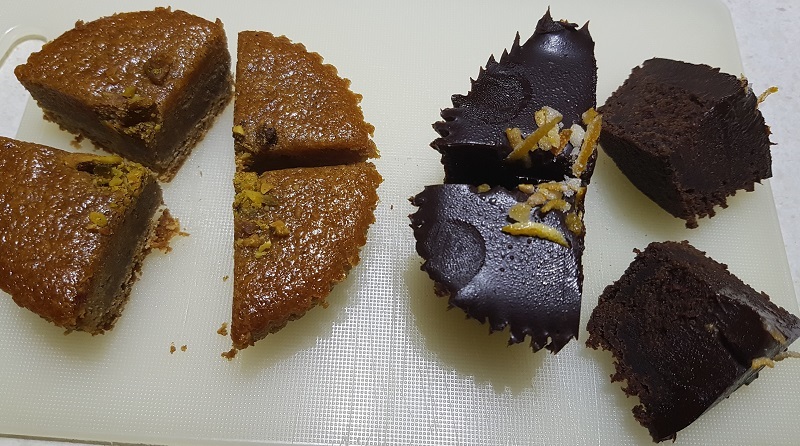 The foodsaver is the best thing we ever bought, it saves us enormous amounts of money because I can buy food when it is on extreme special and when I freeze it I never have to worry about freezer burn. Then on Thursday night, I take the mushrooms out of the freezer and place them in the fridge to defrost. 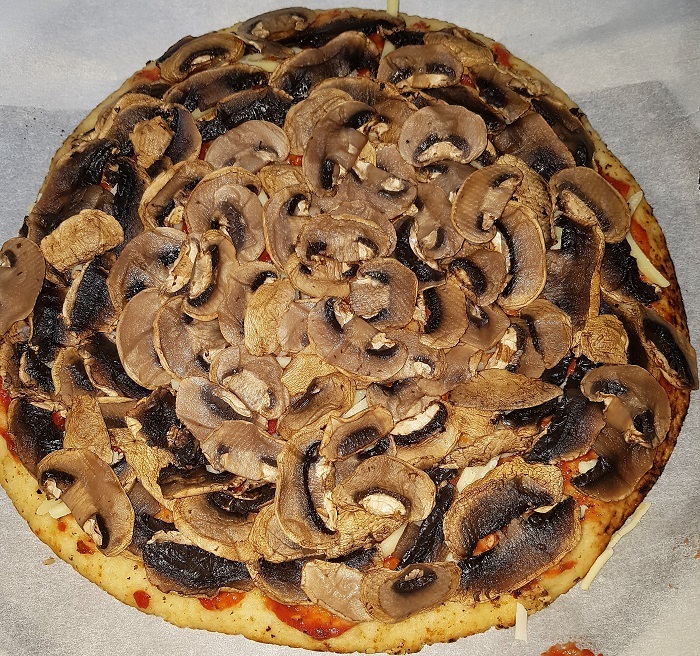 On Friday when it is time to build the pizza, I open the packet and place them on some paper towel to drain – as there will still be some mushroom moisture trapped inside the packet. This process is 100% a keeper for me. 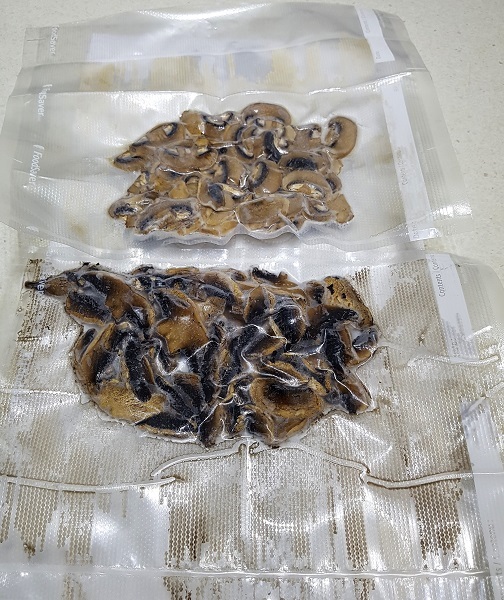 I tried two different types of mushroom – Aldi calls them “whole” and “bbq flat”. The next time mushrooms are on special, I will buy up and freeze. And now I am thinking of other things I can bulk prepare and freeze – capsicum is next on our list, just last night I froze some leeks. Every week I make pizza and it is the best pizza I have ever made, since last week. This time was no exception to the rule. I use the Aldi pizza bases, topped with pizza sauce, pizza cheese, mushrooms, olives, pineapple, capsicum, feta cheese, ham, bacon, pepperoni, more cheese, then an egg is poured over the top. It was just far easier, having done the mushroom preparation a couple of weeks beforehand. Some years ago I began reading Sydney food blogs. The main reason was so that I would know the great places to go when we visited. As we usually day trip and somewhat rarely at that, I want to know where the great places are so we can visit. 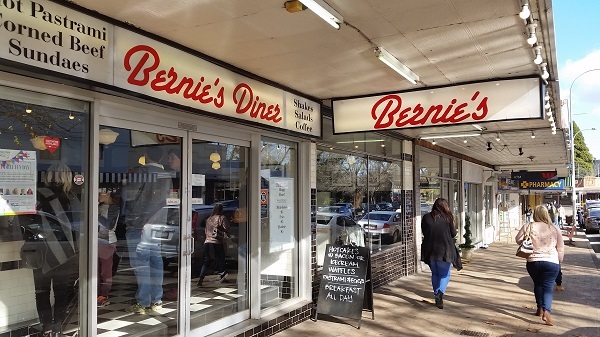 Sydney food bloggers often blog food from regional NSW when they travel and this is how I found out about Bernie’s Diner sometime around 2012/2013. I do not think it was very long between my reading about the place and us visiting. 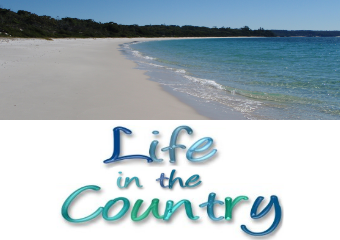 We have been back at least once a year since then – well it is about a 60km drive otherwise we would go more often. The owner was featured on SBS about a week before we went this on most recent visit so it was absolutely packed. Standing room only as you can see in that top pic there – all the booths were full and people were waiting for other people to leave so they could grab a booth. We just got a couple of chairs at this kind of breakfast bar that runs along behind one side of the booths. 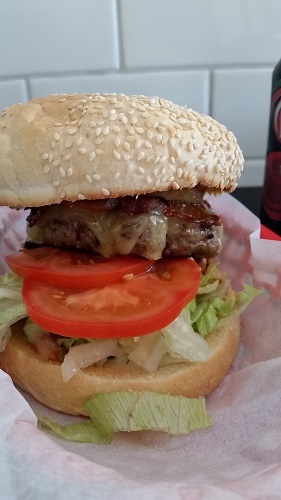 We usually go for the burgers here. 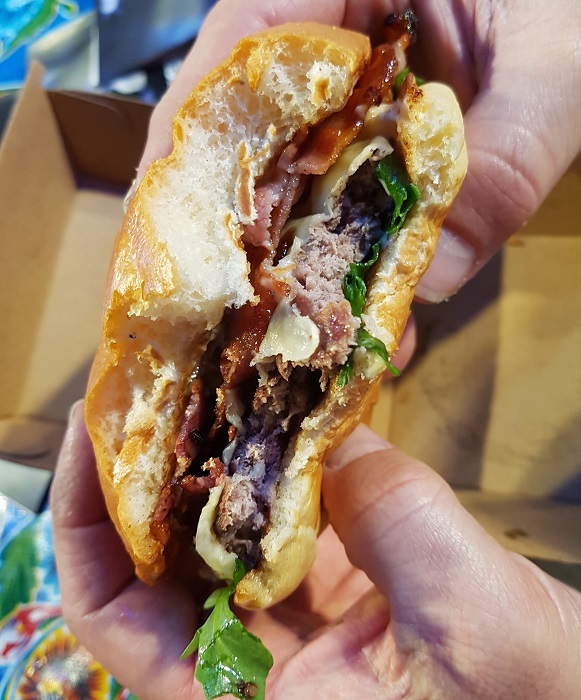 I get the Waikiki, the other half changes up his order each time. 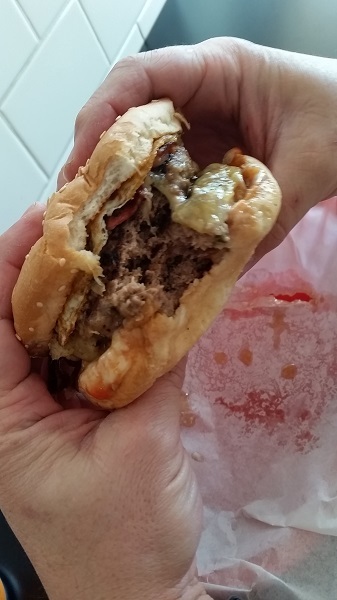 This time he did a double cheeseburger with bacon and egg. 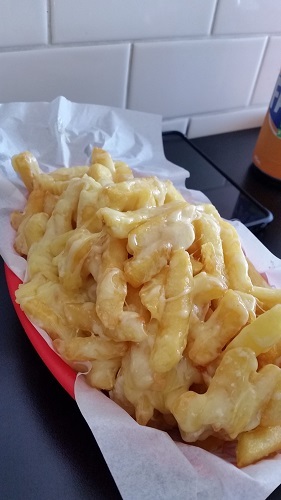 We also get a serve of cheese fries. These are amazing. The regular fries are also excellent. 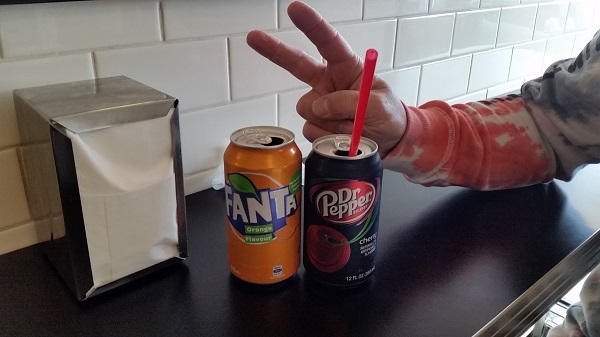 I also splurge and have my one occasional soda – so occasional I can tell you exactly when the last one was – November 2016, when we last visited Bernie’s with Sephyroth. 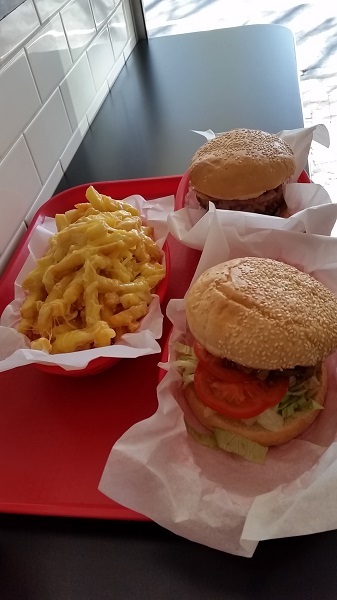 The things you need to know about Bernie’s Diner – BYO paper towel or napkins, because the provided napkins while authentic to the diner experience are not exactly built for cleaning up after one of these great burgers. 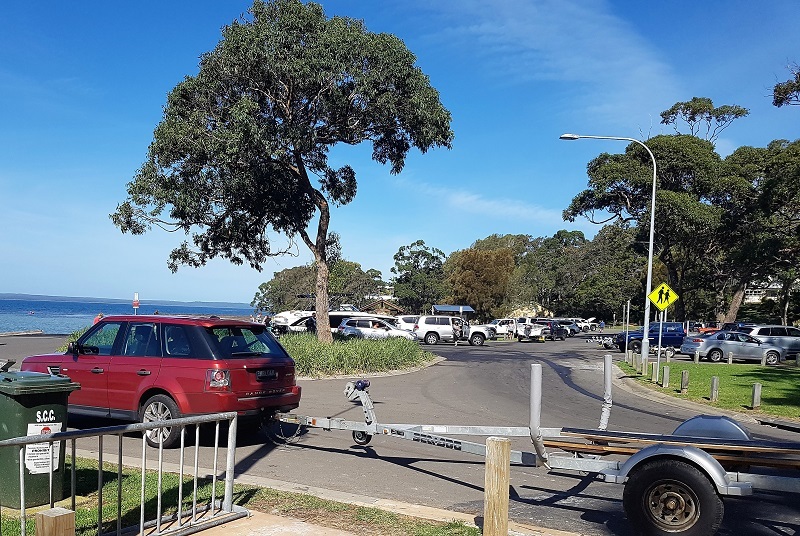 There are bathroom facilities hidden out the back after you walk through a spare empty room – I would expect that room might soon be in use with booths and seating and quite rightly so given the amount of people visiting here these days. The sink in the toilets is only a half sink so that is also not very helpful with a good after-burger clean up. Our new Westinghouse fridge has been a great addition to our household. So much space, and everything has a specific home. 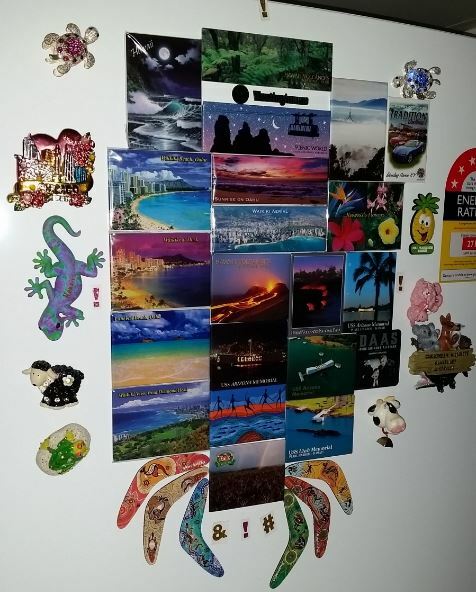 Today I will take you on a fridge tour. The top shelf is where lunches for The Other Half reside. Those are his cans – every second can is a Solo can. While I no longer drink my calories he is losing weight without trying so the occasional can is cool with me. The next shelf down is mainly dairy storage AKA extra cheeses, chook yoghurt and meats. 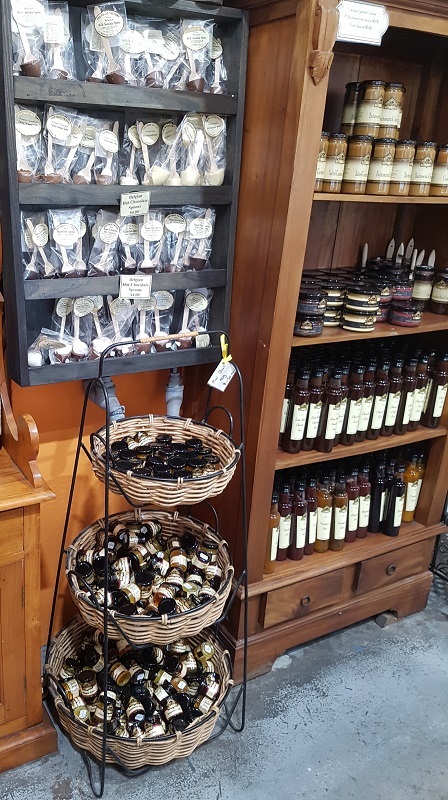 Then we have a treats shelf, that grey storage container there holds all our dark chocolate, there is some hommus for me and on the other side is a roll out shelf with things like garlic, chili, ginger, jams, and our aioli. I get the wasabi aioli from Aldi, it is amazing. 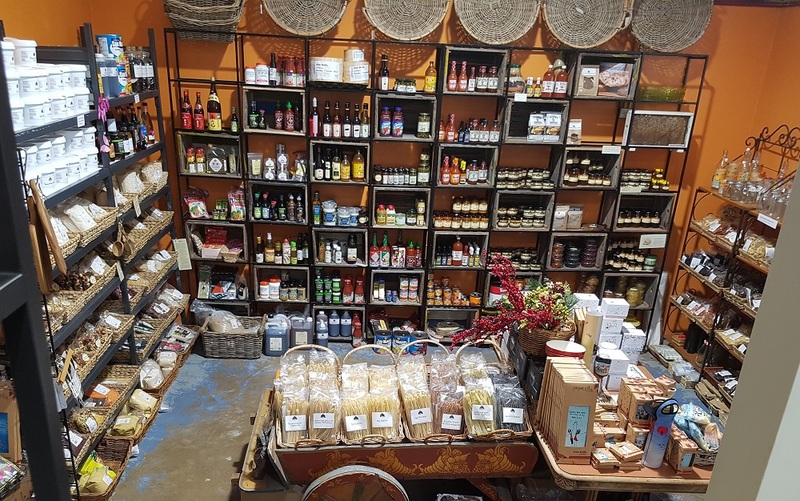 The final shelf here has tinned tuna, our cheese in use drawer, eggs, and in that little alfoil package is a ham and cheese croissant snack. I made them for lunch for The Other Half yesterday and there was an extra one, so I saved it as a snack for myself in case I wanted it for lunch today. For lunches now I find it really difficult to go past my protein shake. My body needs the nutrients in there way more than it needs a butter croissant, especially after a tough workout. The shelf with the large pink container – that has all our potatoes – sweet and normal. I can fit about 10kg of potatoes in there. We found a place that sells a 5kg bag of potatoes for the same price I buy 2kg for normally, so when we go past there we tend to stock up. I keep them in the fridge now which extends their life significantly BUT it makes my hands super cold when I have to peel them. I try to remember to put them out an hour before peel time.There is a watermelon treat for the chooks there too. Next to it in the grey container is my apples. Then we have two fruit and vegetable shelves. Carrots, mushrooms, broccoli, leeks, zucchini, then in the bottom crisper there is a cauliflower, green capsicum, red capsicum and 1.5kg of brussel sprouts which finally returned to the shelves at Aldi this week. The Other Half had to stop me from buying even more of them! I have missed them so much, we will incorporate them into every single meal this week. 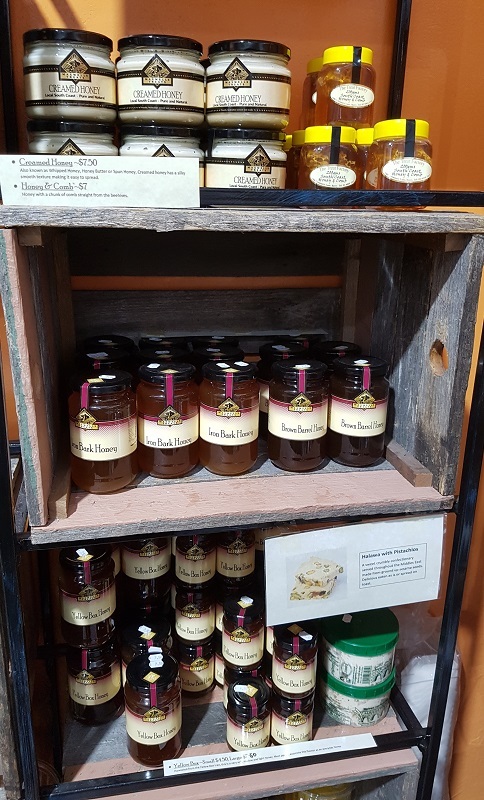 Some more treats reside on the top shelf here. Peanut butter on apples is my daily treat right now, and we usually have something dark chocolate with afternoon coffee – kit kat dark is the present go-to, but I limit myself to just one serving. San Pellegrino is my other more occasional treat. I grab them if I am headed out for errands or if we are going for a drive in the car. When we are staying here I mostly drink my Soda-Stream carbonated filtered tap water. 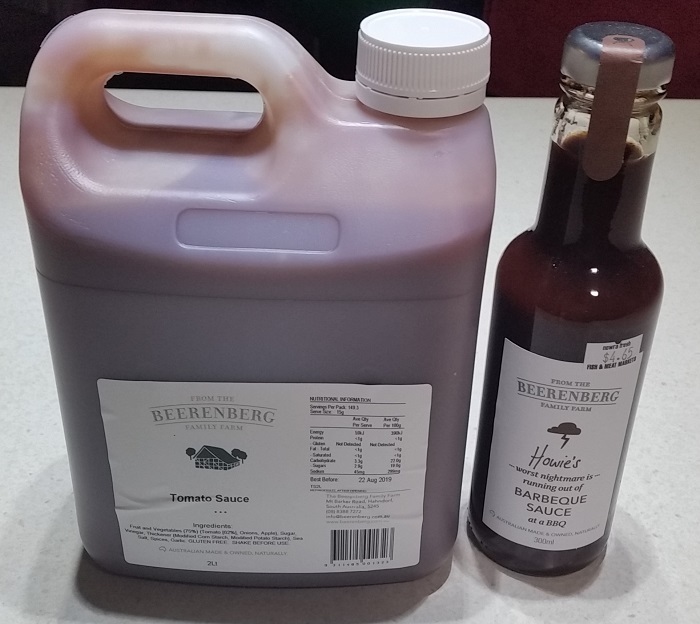 Next to that some more condiments – the South Aussies will recognise the Beerenberg tomato sauce. 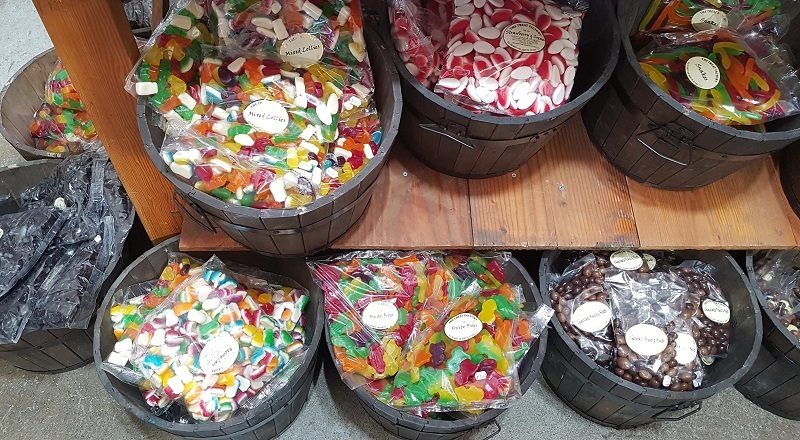 When we first moved here we could not get it, relatives would bring us 2 litre flagons from the store in Hahndorf. 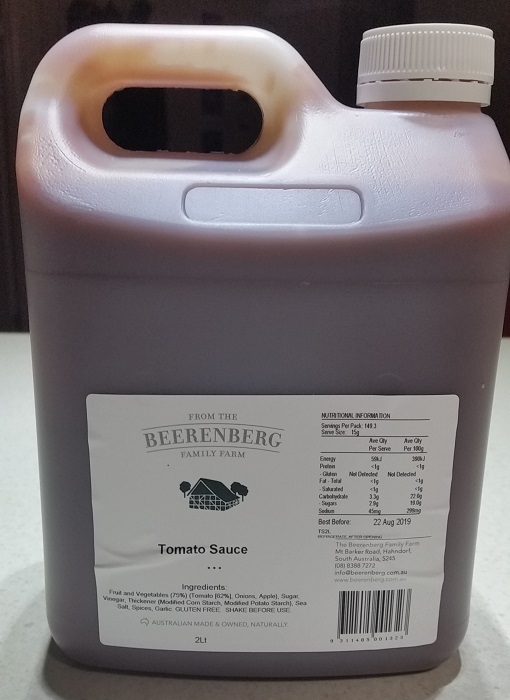 Now it is available on the shelves and it is the only tomato sauce I could imagine using. It is that good. 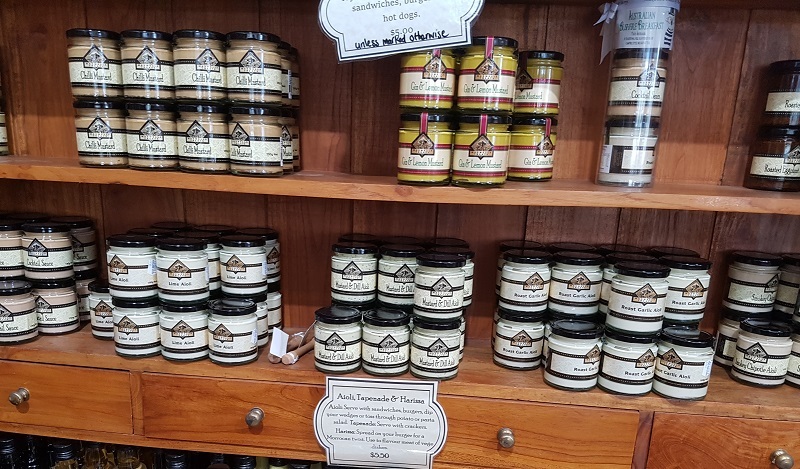 The vegemite is not for me – I am perhaps not Australian enough because I do not like it. 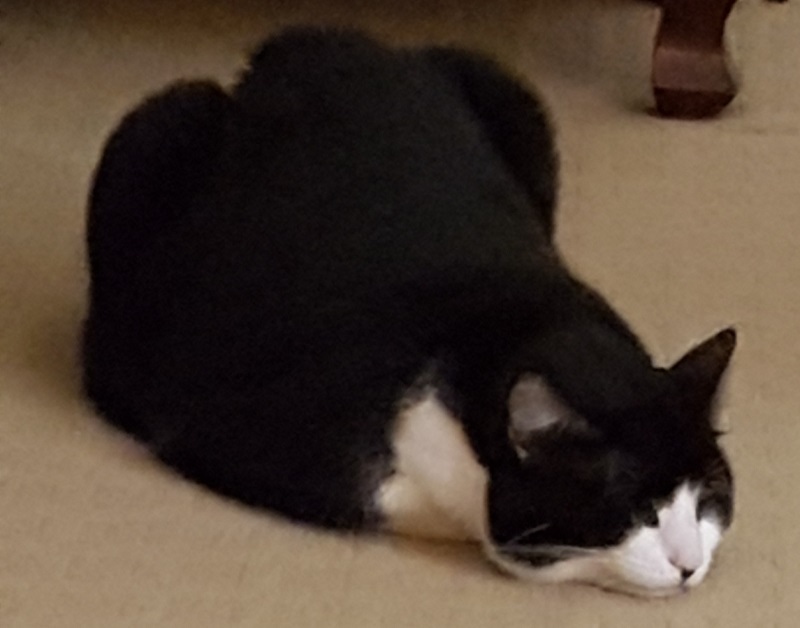 The Other Half does, though. The olives are mine. 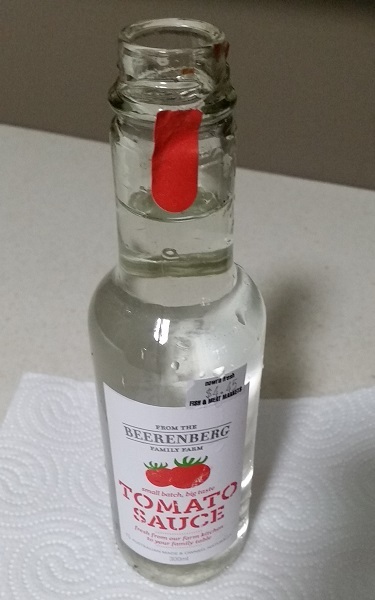 My soda stream bottles, the Costco maple syrup which I was surprised to find should be kept in the fridge, a bottle of mineral water with lemon for visitors, bottles of water, and then all that milk. I switched to almond milk for my smoothies – it is less calories and tastes incredible to me. 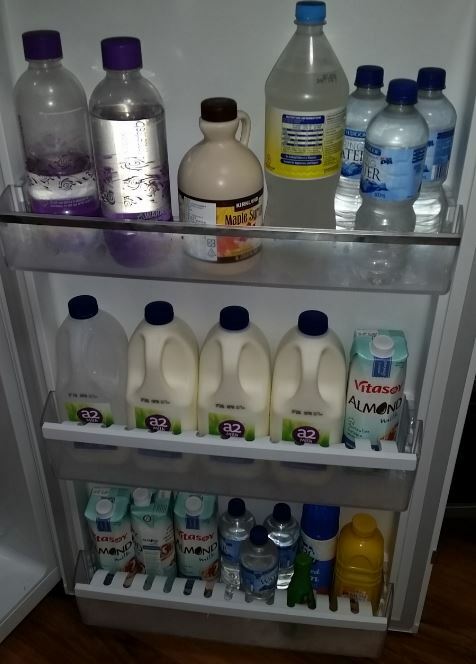 The A2 milk you see there will last us for 2 weeks. 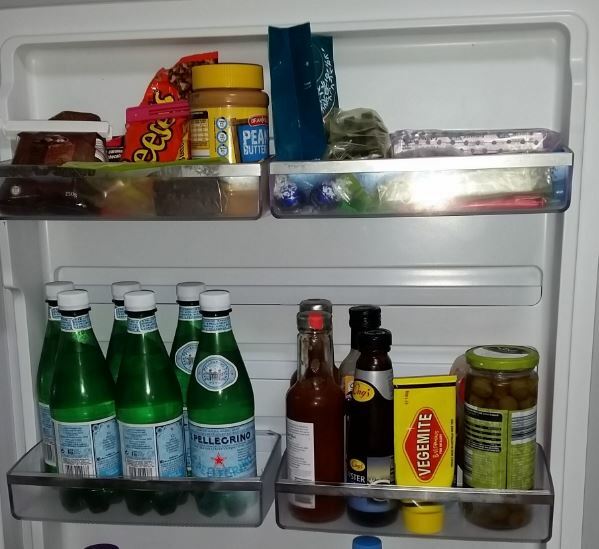 Right at the bottom there, some more bottled water, my lemon and lime squeeze bottles and some whipped cream which I will *very* occasionally put on top of a hot chocolate, milo or coffee. We are down to one grocery shopping trip a fortnight, made after 6pm on the weekends when everyone else is doing other things. 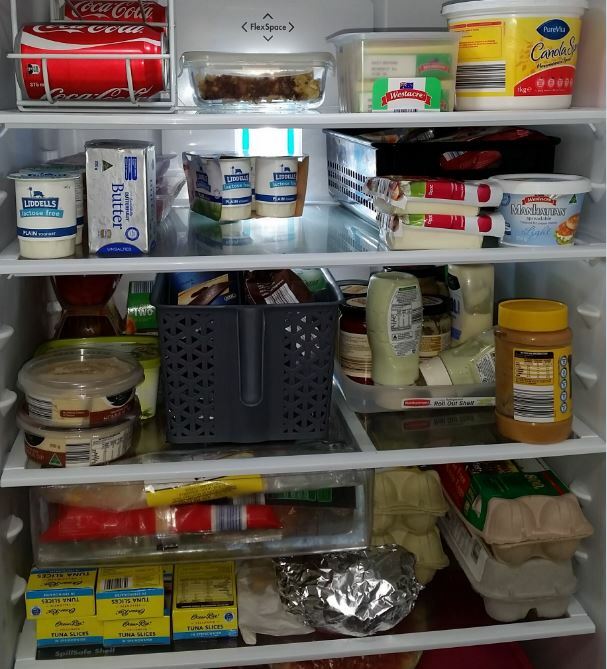 The bigger fridge has helped a lot – I can buy milk for two weeks now without having to worry about where I will put it, and the next time I go to Costco I will probably buy 4 of their large cheeses which keeps extremely well, that will mean I don’t have to buy cheese for 3 months at least, maybe 4. We buy all our meat in bulk once every 2-3 months then foodsave and freeze it except for beef mince which I buy fresh each fortnight. 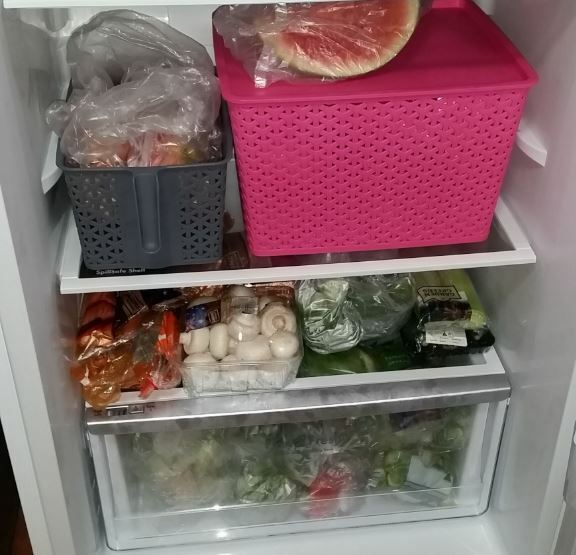 But the freezer and how we organise it, that is a story for another post. :) I just did a big pantry clean out this weekend too. 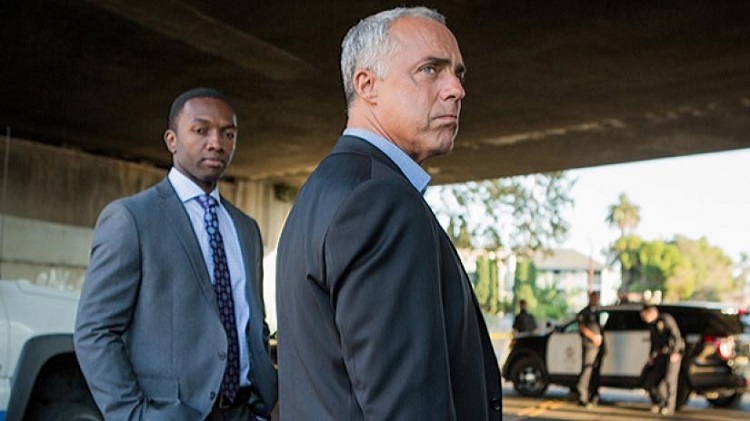 That is also a story for another post.